CELL PHONE SIMETERY: "Dignified Data Gardens To Rest In Pieces"
View Poll Results: Would You Like A Memorial Place For Your Old Phones? NAW! Let it rot in the junk drawer. Maybe, How much is it gonna cost me? Thread: CELL PHONE SIMETERY: "Dignified Data Gardens To Rest In Pieces"
Opening Soon in The land of Galaxia Notus-II. Dig those dead cellphones out of your . kitchen junk drawers or out of the junk closet....if spreaded on the hwy, go . scoop up the pieces because we provide free memorial lots for you to give your once right-hand buddy the dignity it deserves....a plot to rest in pieces. 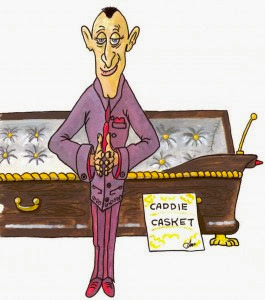 Post your dearly departed device name, purchase-death dates, a small summary of how they made that, uh, last call and we provide the custom toomie and a beautiful resting place free. You can plant as many old phones here as you like. we have plenty room. No burying one ontop of another or dumping behind the brick wall after the family leaves is going on HERE! Lot 2:.......Rico Android - Dell Streak - 03/11/2011 - 02/28/2013 "Lost its mind and started making harassing calls.. had to pull the plug"
Lot 7, 8....In Memory of CellPhone Pioneers. 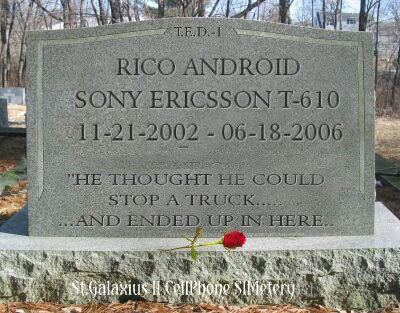 "they paved the way....."
Lot 9........Rico Android - Sony Ericsson T-610 "His polyphonic boof thought he could stop a truck.....ended up in CFS"
Last edited by Rico ANDROID; 03-14-2013 at 06:48 PM. Last edited by Rico ANDROID; 03-12-2013 at 07:56 AM. Businss is currently...uh..."dead"...around here but , we will be here anytime you need us.. Of course we DO NOT expect to see any Galaxy Note II ever needing our services and that's a certainty.... Just dig around your old junk drawers and food disposals. Post your short bio here about the old device and we will take care of the rest! re: CELL PHONE CEMETERY: "Dignified Data Gardens To Rest In Pieces"
LOL "bizzness" is always slow starting up...but if you build it...they will come. Heh heh..... will probably post toomies of my previous deceased 'right arms'....that seemed to get things rolling before. I saw someone else do this and I thought it was an interesting exercise...I don't have these buried in a cemetery, most disappeared one way or another over the years but this is my phone evolution from 1996 to the present. i tried embedding the clip but donot yet know how on this forum.. wow looks like it converted thi link nicelyx. check out a video and see ic one of your old devices are shown. i lkke your post of phones-past! Last edited by Rico ANDROID; 03-14-2013 at 12:31 PM. This was when the smaller the device the coolest! I had the smallest one in my office and thought I was "MR. IT" with my polyphonic "Our House" and "Every Rose Has Its Thorn" ringtone! woo! (ps. not me or my home video.. just found this in a crypt wall in CFS and thought, hey, no one else us using it.. why not..
Last edited by Rico ANDROID; 03-14-2013 at 06:45 PM. It is pretty funny how we went from smallest was best. I was always waiting for this one to come on the market.